1Professor, Jawaharlal Nehru Medical College, Sawangi Meghe, Wardha 442001, Maharashtra, India. 2Professor, Radiology, Jawaharlal Nehru Medical College, Sawangi Meghe, Wardha 442005, Maharashtra, India. 3Third year Resident, Radiology, Jawaharlal Nehru Medical College, Sawangi Meghe, Wardha 442005, Maharashtra, India. 4Second year Resident, Radiology, Jawaharlal Nehru Medical College, Sawangi Meghe, Wardha 442005, Maharashtra, India. Professor, Jawaharlal Nehru Medical College, Sawangi Meghe, Wardha 442001, Maharashtra, India. Kashikar SV, Lakhkar B, Pandey A, Gupta A. Catastrophic Cerebellitis in an adolescent: A Case Report. Oman Med J 2014 May; 29(4). An adolescent presented with headache and projectile vomiting and showed ataxia, dysarthia and nystagmus with normal cognition. A diagnosis of acute cerebellitis was made on the basis of computed tomography and magnetic resonance imaging findings. He developed seizures and had a rapid downhill course with death at 48 hours after admission. Clinically, patients of acute cerebellitis present with fever, nausea, headache and altered sensorium with cerebellar symptoms. Inflammation of the cerebellum compresses the brain stem and induces mental alterations. It is a rare pathology developing due to an infectitious cause, post-infectitious or post vaccination etiology. Many times it is not possible to identify the causative agent. Cerebellitis can be mild where recovery occurs in few weeks and no abnormalities are seen on diagnostic imaging studies. On the other end, severe cases have focal neurological deficits, altered consciousness, raised intracranial pressure and abnormal neuroimaging. Treatment should be tailored to individual needs according to presentation, severity, and etiology. We discuss clinical features, diagnosis and management of acute cerebellitis which is an important cause of acute cerebellar functional disorder in childhood. Keywords: Cerebellar Diseases; Magnetic Resonance Imaging; Spiral Computed Tomography. A 17-year-old male presented to the physician with severe headache and projectile vomiting of 3 days duration. There was no history of fever, sore throat or vaccination. Neurologic examination showed ataxia, dysarthia and nystagmus with normal cognition. There were no signs of meningeal irritation. Blood investigations were normal. Cerebrospinal fluid examination (CSF) showed lymphocytosis with elevated protein and glucose. Gram stain and cultures of CSF were negative. Electroencephalogram was obtained which revealed epileptiform activity. The patient became irritable the next day and developed meningeal signs. Emergency Computed Tomography demonstrated swollen cerebellar hemispheres with compressed fourth ventricle, effaced quadrigeminal cistern and mild hydrocephalus (Fig. 1a and b). 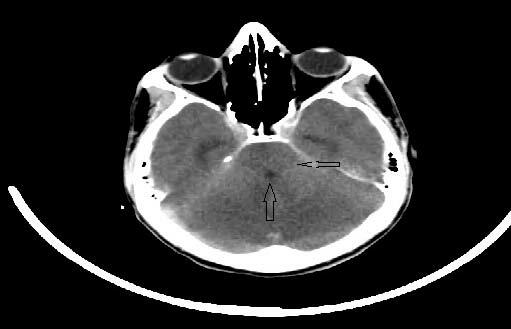 Figure 1a: Axial non-contrast computed tomography showing diffuse cerebellar swelling causing compressed fourth ventricle (up arrow), effaced quadrigeminal cistern (left arrow). 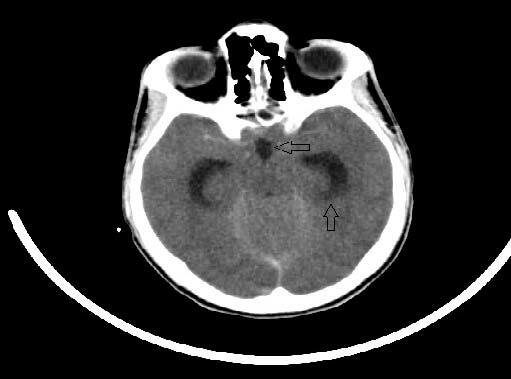 Figure 1b: Prominent third ventricle (left arrow) and opened temporal horns (up arrow) due to hydrocephalus is seen. 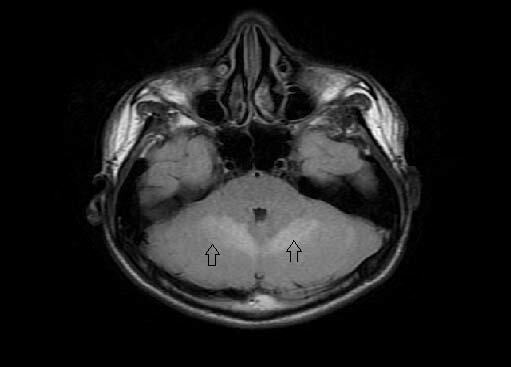 Figure 2: Axial T2Weighted imaging demonstrating the hyperintense cerebellar hemispheres (down arrows). Figure 3: Axial Fluid attenuation inversion recovery (FLAIR) image shows the hyperintense cerebellar hemispheres (up arrows). 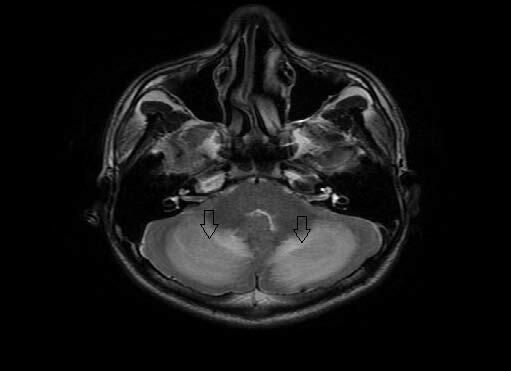 A diagnosis of acute cerebellitis was made by Magnetic resonance imaging findings of hyperintense cerebellar hemispheres on T2Weighted imaging (Fig. 2) and fluid attenuation inversion recovery sequence (Figure 3). There was patchy enhancement on post gadolinium study and restriction of diffusion (Figure 4). Lumbar puncture was avoided due to the concern of tonsillar herniation. Intravenous acyclovir and dexamethasone was started. The patient developed seizures in the same evening with alteration of sensorium, photophobia and nuchal rigidity. He had a rapid downhill course over the next 12 hours with respiratory arrest resulting to death. Figure 4: Diffusion weighted image shows restricted diffusion. Blood tests are often normal or nonspecific. Toxicological screening is helpful to detect drug causes such as cyanide or alcohol. CSF analysis may reveal pleocytosis and elevation of protein. Isolation of micro-organism, antibody titre measurements in serum or CSF, and polymerase chain reaction in CSF may help reach the etiological organism. It is hypothesized that antibodies are produced as a result of cerebellar damage. These are autoantibodies against glutamate receptor, antiganglioside antibodies and centrosome auto antibodies. Biopsy specimens show edematous changes in the cerebellum with lymphocytic and eosinophilic infiltratration without demyelination. Computed Tomography (CT) in acute cerebellitis might be normal. It may show subtle, bilateral, symmetrical cerebellar hypodensities. These findings may be overlooked initially.2 More severe case have cerebellar edema, ventricular dilatation, transependymal edema and tonsillar herniation. Due to its easy availability, computed tomography of the brain is very useful in emergency cases and in the acute stage of cerebellitis. Follow-up scans help visualize cerebellar edema, compression of the brain stem, hydrocephalus and tonsillar herniation. There is absent contrast enhancement on CT which is a characteristic finding.7 Chronic stage of the disease shows cerebellar atrophy. MRI features show bilaterally symmetric abnormalities in the cerebellar grey and white matter. There are hypointense signal on T1 weighted images and hyperintense signal on T2 weighted images with restricted diffusion on diffusion weighted imaging.8 The most common pattern is cortical swelling.1,3 White matter involvement can be patchy or diffuse. Acute and subacute cases can show contrast enhancement which is predominantly pial or along the cerebellar folia. Obstructive hydrocephalus may occur due to compression of the fourth ventricle.9 The resolution of the disease process may show the cerebellum returning to its normal appearance or show cerebellar atrophy. The residual hyperintensity on T2 weighted images may remain for weeks to months and thus MRI is not helpful in predicting the prognosis. Acute intoxication, demyelinating diseases and posterior fossa neoplasms can be the differential diagnosis in bilateral cerebellitis.1 Detailed history might give a clue to drug exposure and alcohol. 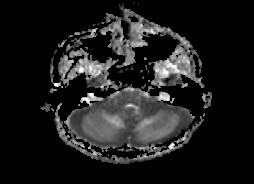 Neoplasms of the posterior fossa are usually unilateral with characteristic imaging appearances. There is predominant affection of the white matter in demyelinating diseases. Acute disseminated encephalomyelitis (ADEM) if restricted to cerebellum is difficult to distinguish from acute cerebellitis, especially when there is a history of viral illness or vaccination.10 Lead poisoning also might be a differential, given the clinical background. Lhermitte-Duclos disease can be differentiated by post contrast enhancement and symptomatic improvement seen in cerebellitis. Histopathology of biopsy or autopsy specimens reveal exclusive T-cell cellular infiltrate in the molecular layers, loss of Purkinje cells and intense vacuolation at the interface of the molecular layer with the granular layer. Leptomeningeal exudate of lymphoplasmocytic and mononuclear cells may also be seen. Acute cerebellitis in this case was associated with cerebellar swelling, hydrocephalus and brainstem compression which turned out to be life-threatening. This case highlights the importance of MRI as a cornerstone in establishing the diagnosis and also helps us understand the potential fatal outcome that at times is associated with acute cerebellitis. The reason for death is transforaminal and transtentorial herniations due to cerebellar swelling. 1. Montenegro M, Santos S, Li L, Cendes F. Neuroimaging of acute cerebellitis. J Neuroimaging 2002; 12: 72-74. 2. De Bruecker Y, Claus F, Demaerel P, Ballaux F, Sciot R, Lagae L, et al. MRI findings in acute cerebellitis. Eur Radiol 2004; 14:1478-1483. 3. Ciardi M, Giacchetti G, Fedele C, Tenorio A, Brandi A, Libertone R, et al. Acute cerebellitis caused by herpes simplex virus type 1. Clin Infect Dis 2003; 36: e50-54. 4. De Ribaupierre S, Meagher-Villemure K, Villemure J, Cotting J, Jeannet P, Porchet F et al. The role of posterior fossa decompression in acute cerebellitis. Childs Nerv Syst 2005; 21: 970-974. 5. Wagel J, Gruszka J, Szewczyk P, Guziński M, Sąsiadek M. Herniation to foramen magnum in the course of cerebellitis in a 4-year-old boy, as shown by CT and MRI – case report. Pol J Radiol 2010; 75(3): 42-46. 6. Sawaishi Y, Takada G. Acute cerebellitis. Cerebellum 2002; 1: 223-228. 7. De Mendonca J, Barbosa H, Viana S, Freitas F, Viana M, Ferreira A. Pseudotumoural hemicerebellitis: imaging findings in two cases. Br J Radiol 2005; 935(78): 1042-1046. 8. Gamanagatti S and Nayaz Z. A child with cerebellar ataxia. The British Journal of Radiology 2008; 81: 82-84. 9. Dogulu F, Onk A, Kaymaz M, Kardes O, Baykaner M. Acute cerebellitis with hydrocephalus. Neurology 2003; 60: 1717. 10. Nagamitsu S, Matsuishi T, Ishibashi M, Yamashita Y, Nishimi T, Ichikawa K, et al. Decreased cerebellar blood flow in postinfectious acute cerebellar ataxia. J Neurol Neurosurg Psychiatry 1999; 67:109-12.